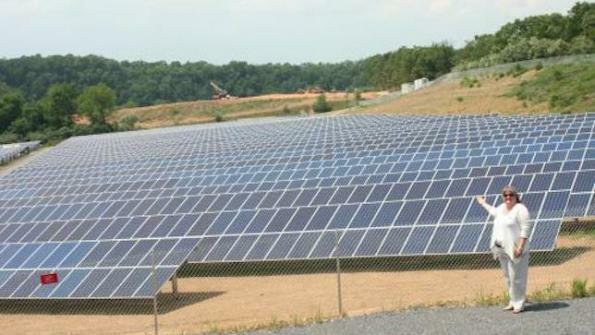 Washington County, Md., has developed into Maryland's "Solar County" by transforming 130 acres of landfill into solar renewable energy for the county government and school district. Through public-private partnerships with three solar energy producers, 130 acres of solar panels have been constructed on formerly empty landfill space. The county’s government and school district will purchase 14 megawatts of the 25 megawatts produced upon the project’s completion at the end of the year, according to a National Association of Counties press release. County officials have set the goal of becoming one of the first counties in the nation to have 100 percent of its government facilities powered by renewable energy, according to Herald Mail Media. Montgomery County, Md.-based EPG Solar presented the idea of using acres of Washington County’s landfill as an energy source more than three years ago. Spear Point Energy and Northern Energy later signed on to build out the solar field. Now, the formerly barren acres of land are raking in $375,000 annually in rent revenue, which is attributed to one penny per kilowatt-hour generated by the three energy companies, according to the release. Contractors now build and maintain the property, Pippel said. The lucrative partnership is a benefit to Washington County and its partners, Robert Babcock, owner of EPG Solar, told NACO.